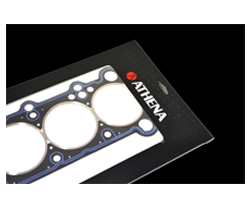 Athena is a group of 7 companies, founded in 1973, producing gaskets for industrial, automotive and power sports applications. They all operate according to UNI EN ISO 9002 quality standards. PMI Europe offers a range of multi layer steel head gaskets for European automotive applications. The gaskets consist of 2-5 layers of steel sheets of different compositions and covered by an elastomer layer that gives excellent sealing properties. Beadings around the combustion chambers and oil/coolant passages increase the local sealing pressure (Macro sealing) whilst full-surface or partial elastomer coatings provide additional tightness (Micro Sealing). Thanks to their composition, Athena gaskets considerably incease the sealing and injection pressure to the lowest engine head bolt tension and guarantee better reliabiltity and performance. Athena Gas Stopper technology is a key design feature of Athena MLS gaskets. The stainless steel stopper layer features an “active fold” which deliveres a high pressure seal around the cylinder bore when tightening the cylinder head. The gas stopper / active fold is located around the combustion chamber, allowing cylinder head and engine block to clamp tighter helping to prevent gases leak from the combustion chamber.